We are a friendly local pub which attracts an eclectic mix of people creating a pleasant and fun atmosphere. In summer the large garden has plenty of space & tables to enjoy a meal from the lunchtime or evening menu. In the winter the woodburning fire creates a warm and cosy place to enjoy a glass of mulled wine together with the pub cat Paddy who can be seen stretched out in front of it. We have a wide range of food & drink available which is available to view on this site. 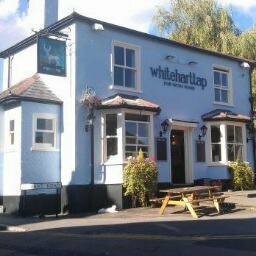 The White Hart Tap is open from 11:00 every day (Excl. Sun) and closes at 11 p.m.